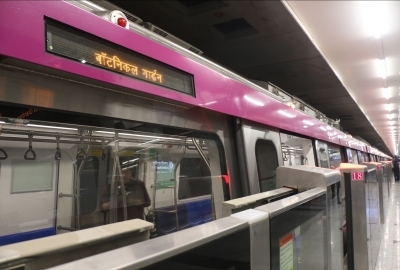 New Delhi July 13 (IANS) Delhi Metro services were hit for two hours on the Magenta Line on Friday when an overhead wire developed a snag between R.K. Puram and IGI Airport stations. Heavy rain in parts of the city is stated to have caused the fault. The snag was detected around 4 p.m. The services were not fully restored for two hours a Delhi Metro Rail Corp (DMRC) official said. The routine run was restored only at 6.40 p.m. In the meantime the transporter ran trains on short loops on either side -- between Botanical Garden and R.K. Puram and IGI Airport station and Janakpuri West. The Magenta Line is one of the newer additions to the vast Delhi Metro network and was inaugurated last December. The line affords connectivity to the Violet Line at Kalkaji station Blue Line at Janakpuri West and the Yellow Line at Hauz Khas.